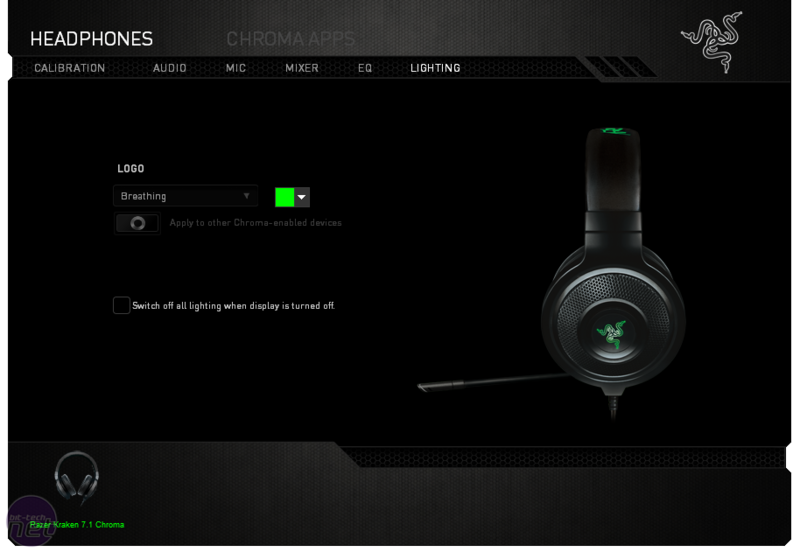 The key features of the Razer Kraken 7.1 Chroma are given away in its name – no, it can't spawn ship gobbling sea monsters, but it does feature virtual 7.1 surround sound and Razer's Chroma RGB lighting system. 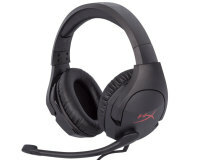 Since these require audio processing and power, respectively, the headsets uses a USB connection, which also allows it to use a digital rather than analog microphone. The physical design is much the same as the Kraken Pro. In short, this means that it isn't cheap plastic tat but the build quality is nothing to write home about either. It has a relatively tight fit around the ears and the headband would benefit from a little more padding too. 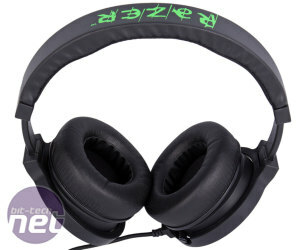 The earcups are circumaural but small – you may need a bit of wiggling to get your ears in. 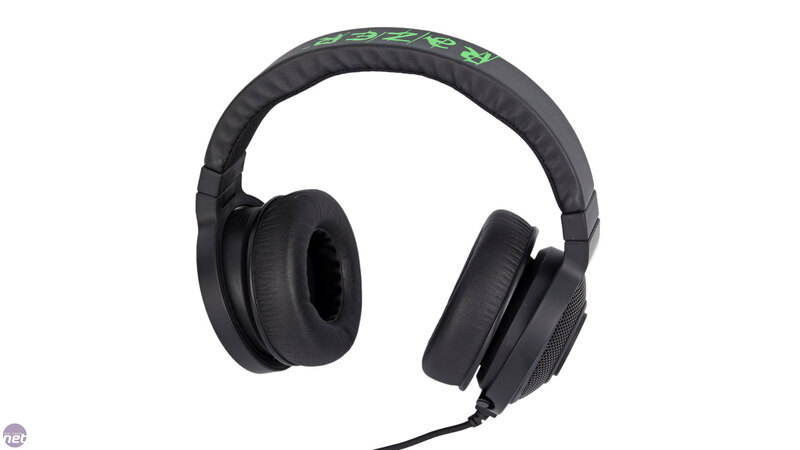 Nevertheless, once it's secure it remains fairly comfortable and forms a good seal around your ears – great for keeping external noise out but also for keeping heat in. 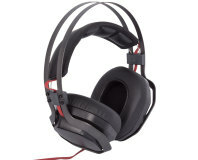 The earcups fold neatly inwards for easy transport as well. 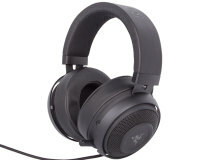 A retractable, unidirectional microphone is embedded in the left earcup. It's very flexible and has a mute button near its tip, which helpfully lights up red as a mute indicator. 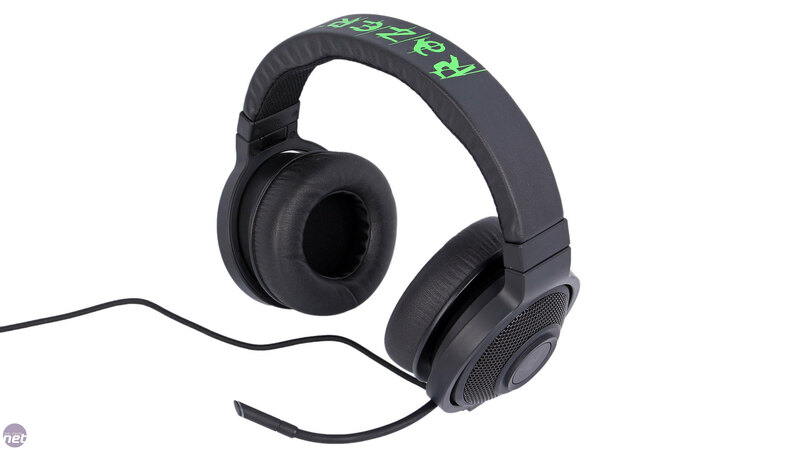 However, it's very small and a bit fiddly to access, and is also the only physical control the headset has – there's no in-line remote and no onboard volume control at all, which we think is poor form. 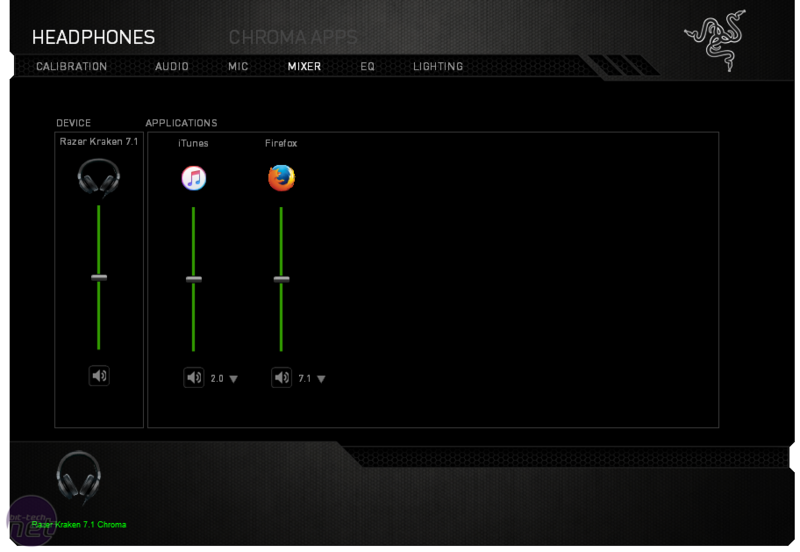 Instead, all controls are handled through Synapse, which requires an Internet connection and creation of an online profile to use – arguably beneficial for a keyboard or mouse with lots of custom settings, but a bit ridiculous for a headset. 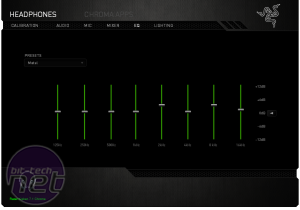 Still, the surround sound calibrator is pretty cool and does give you some positional awareness, at least with the helicopter noise it generates. 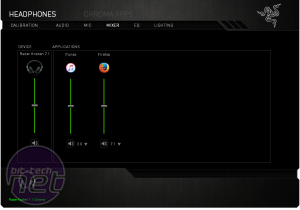 After this, all the menus are clearly laid out with a few audio and microphone settings, an EQ mixer with the usual music presets, lighting settings and a mixer where you can configure volume and surround sound settings (on or off) for each program and game. 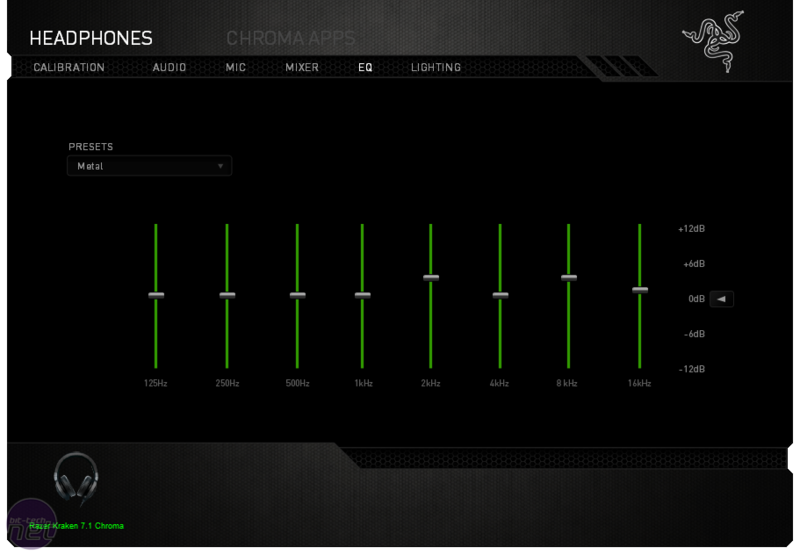 In some ways this is good; you can set the surround sound for games where it makes sense and not for others, and it will auto-switch when appropriate. 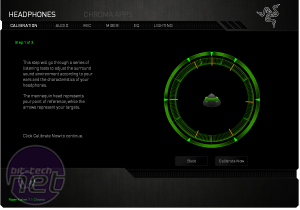 However, assessing where it works and where it doesn't is a pain as you have to leave the program, toggle the option in Synapse and go back to it. An onboard button to toggle it on or off would make more sense here. 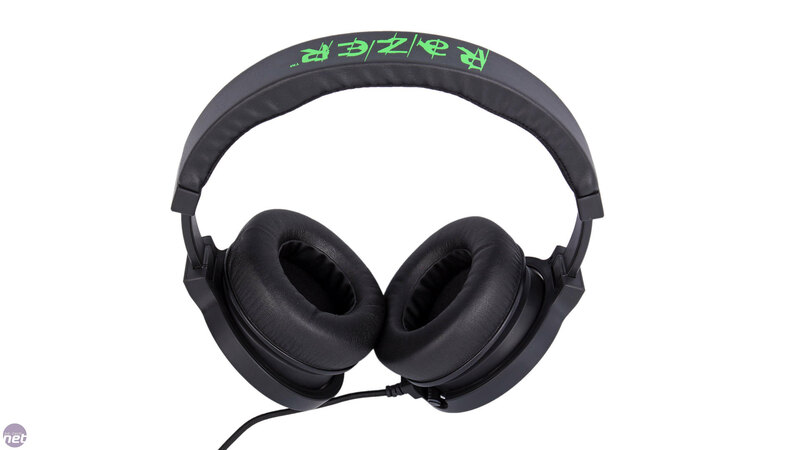 The lighting of the snake logo on each earcup can be set to any static or breathing colour or simply cycle through the spectrum. 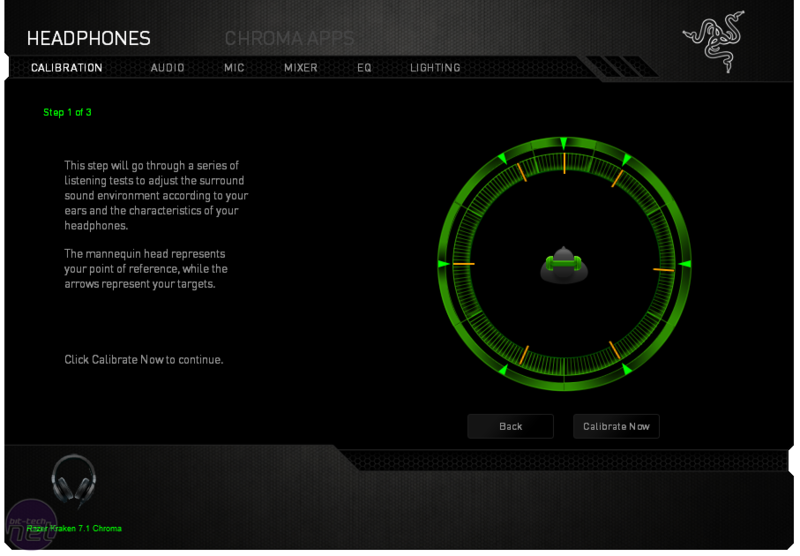 They can't be configured independently but the settings can be applied to other Chroma devices you happen to own. 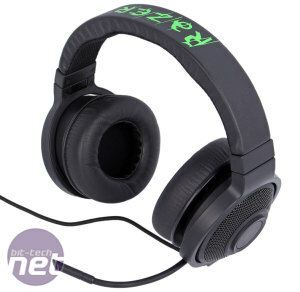 Before we even played any sound through the headset, the first thing we noticed is that it was very sensitive to rubs and knocks against the braided cable. 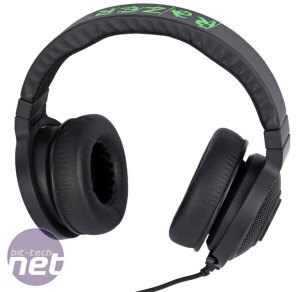 This is especially irksome since the cable unavoidably rests on your shirt and rubs whenever you make a small movement with the noise then amplified in the left earcup. There's no clip to keep it out the way either. 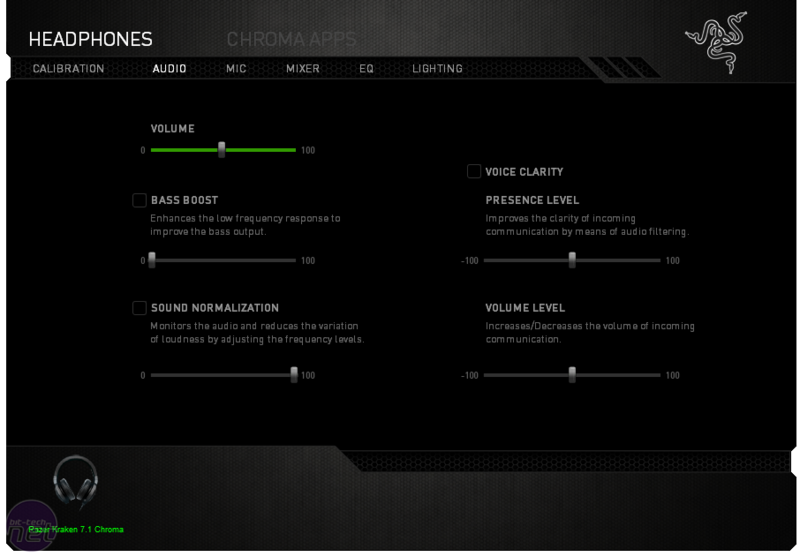 When you have audio playing at normal volumes it's not really noticeable, but when the volume is low or the sound off it becomes really annoying really quickly. 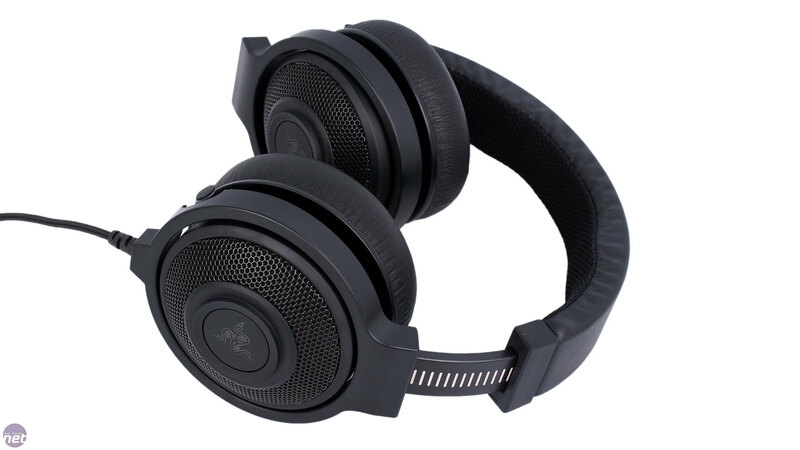 Like the Kraken Pro, we found the soundscape of the Kraken 7.1 Chroma to be too bass heavy, even without the bass boost feature enabled. 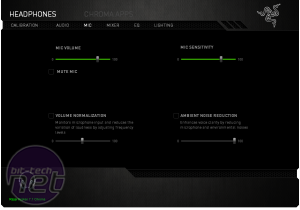 In music, this impedes on mid-range elements, and distorts vocal and acoustic sections to sounding artificially deep. 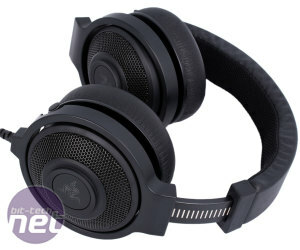 Higher notes from the 40mm drivers are at least produced reasonably well, but this is definitely a headset geared towards gaming above all else, and action games at that – quieter, dialogue-laden sections of games and films are less satisfying. As usual, the virtual surround sound isn't a magic switch that will transport you to the battlefield, but it can add a greater sense of scale in the games where it works. The digital microphone is at least a big improvement on standard analog ones, delivering clear, crisp audio without any background hiss from signal noise. 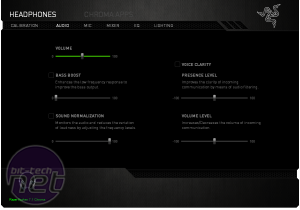 We did need to increase the volume and sensitivity a little for the best quality but this is easily done. Your voice is also clearly audible over background noise, but that can come through quite clearly too. 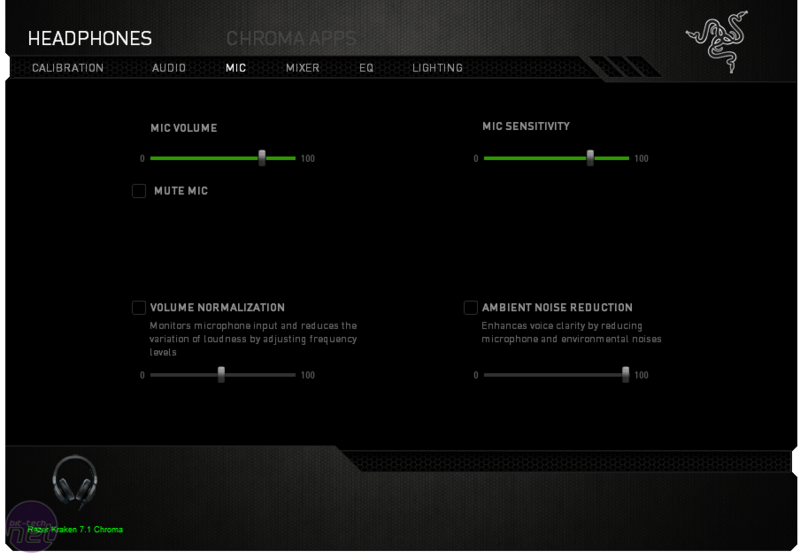 The ambient noise reduction setting does help a little but turn it up too far and it starts to cut frequencies in your voice. Thankfully, the microphone does not pick up any noise from the cable like the speakers do. 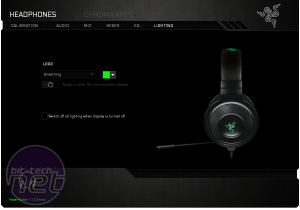 Available for between £80 and £90, the Kraken 7.1 Chroma has a few neat features, with the microphone especially being a highlight. 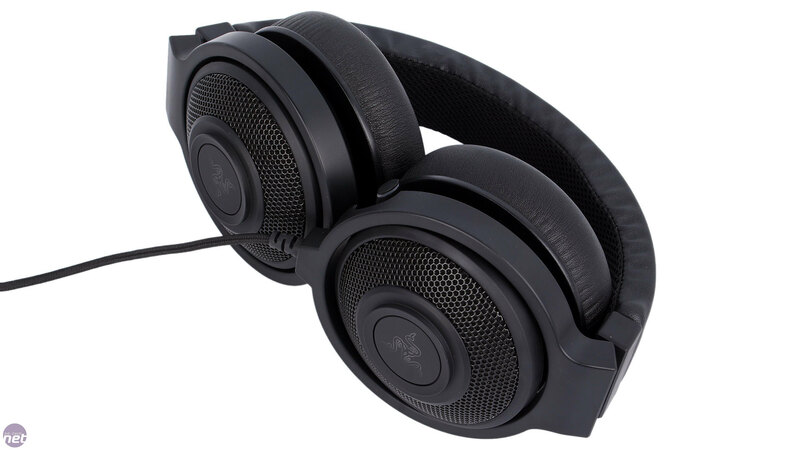 However, for this price, the build quality, comfort and sound quality all sit somewhere between mediocre and fine, and given the reliance on Synapse over physical controls and the cable noise issues we experienced we therefore aren't able to recommend it.